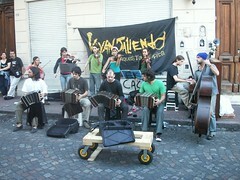 I had heard all of the rumors about San Telmo being “the place” to see street tango. After a few weeks of being in Argentina, I still hadn’t seen any tango shows, so we decided to visit San Telmo one Sunday afternoon. Sunday is supposed to be the best day because the streets are adorned with a big art and antiques fair. In addition, there are incredible bands playing their music on the side of the street, men and children displaying their unique talents for a few coins, and of course….Tango! We started off looking at the art and antiques. While I didn’t find any antiques that fancied my eye, the artwork was quite captivating. There were numerous sensual paintings of tango dancers. I cannot put my finger on it, but something about these paintings engages your eyes, your emotions, and your heart….very much like the dance does. We had only walked around for a short time when we heard the accordion of the famous tango music. We looked to where the crowd was enclosing, and we knew where to go. Unfortunately, I couldn’t see much over the top of people’s heads, but we knew we would see more dancers throughout the afternoon. We continued exploring through the streets, which were lined with merchant after merchant. Ice cream here, fresh orange juice there, and many cheap meat parillas everywhere! Finally several blocks away, we got an excellent front row spot for tango! It was just as enchanting as the artwork. Their legs quickly spun and intertwined at amazing speeds while never losing their serious yet passionate facial expressions. The costumes of the dancers were very classic, and the very high slit in the woman’s dress drew attention to the beautiful lines and movements of her body. It was very exciting to see, but I don’t think it was the best tango I have ever seen. Don’t give up though! There are many restaurants that provide dinner and a show in the amazing neighborhood of San Telmo. Most importantly, that Sunday afternoon was an unforgettable experience. Listening to the street bands and seeing how the art of painting and dance was staying alive and well in this neighborhood was refreshing and different from many places and things you will see in Buenos Aires! This page rendered in 0.249 seconds.